Forum member @margroloc took the time to put together an extensive guide on liquid metal (LM) cooling. LM can be used as a substitute for thermal paste to further reduce temperatures of computer components, such as the processor and graphics card. Some of the dangers of LM include its ability to cause short circuits, and the general difficulty of application. It’s also incompatible with aluminum heatsinks. However, it can be substantially more effective than regular thermal paste. If you’ve tried every other cooling trick in the book, it might be the next step. Consider trying ThrottleStop before you go opening up your notebook! While we’re still on the topic of metal, California-based member @maleko48 tried his hand at creating a custom cooling solution for a Dell Insprion 7577 gaming notebook. The idea was to attach copper heatsinks with thin silicone thermal pads on strategic points around the notebook. The heatsinks would theoretically help draw heat away from the hottest parts of the notebook. It sounds like a logical idea to us. The more surface area, the more effective the cooling. There might even be commercial applications for the DIY product in its current form. Color us impressed. This thread was just posted, so stay tuned for the results! 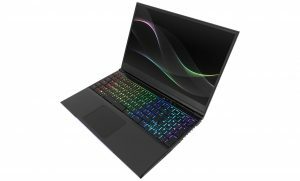 Are There Notebooks with the GeForce GTX 1080 Ti? Before you read any further, the answer is no. There was a rumor that spread on the Internet – of all things – that turned out to be untrue. The GTX 1080 Ti is Nvidia’s flagship desktop graphics card, and requires far too much power to fit inside a traditional notebook chassis. There’s a chance it may fit in an eGPU enclosure, but before you spend that kind of money, consider going with a notebook that already has a GeForce GTX 1080, or even a pair of them. The GTX 1080 (non-Ti) continues to be the fastest single card you can get in a notebook. The MSI GT75 Titan is a large 17.3-inch gaming notebook that features the GTX 1080. It can also be equipped with up to a Intel Core i9-8950HK six-core CPU. Forum member @Phoenix has put up a thorough review of his GT75, including all the benchmarks you would want. It’s about as fast as gaming notebooks get. Slim mechanical keyboard with per-key RGB backlighting. Two M.2 slots and a 2.5-inch bay for storage. Forum member @eiraku had hands-on experience with the GK5CN5Z. The build quality is reportedly solid. It also runs relatively cool and quiet, and the keyboard feels great. On the downside, the notebook lacks a Thunderbolt 3 connection, and has just 3-4 hours of battery life. This Tongfang goes head-to-head with the MSI GS65 and the Gigabyte Aero 15. It should be for sale in the U.S. soon.